Manitou Islands ... "Rugged" Michigan Charm. The Manitou Islands are a part of the Sleeping Bear Dunes National Park, in the northwest corner of the lower penninsula. If you are one who loves backpacking day trips, or rugged camping in legendary surroundings, then these islands are a must visit for you. These Islands have a great Indian legend attached to them. The legend says a mother bear and her two cubs were swimming across Lake Michigan to escape a Wisconsin forest fire. The mother made it to a tall dune ( Sleeping Bear Dunes) and waited for the cubs to get to her. The cubs went down in the lake waters and the mother died while waiting. The two Manitou Islands rose from the spot where the cubs drowned. This kind of romantic legend adds to the charm of this scenic area. Only accessible by boat... the Manitou Island Transit runs out of the Fishtown dock in Leland. You can call for reservations (recommended) at231-256-9061. The round trip fee is currently $30, but check beforehand as todays gas prices could change the fee structure. Here is a PDF map of the islands that shows the ferry route, campgrounds, and ranger stations. The islands played a key role in the early days of the Great Lake's shipping and logging industry. There is a lot of sad, but interesting history associated with them. North Manitou is the largest of the two islands, with over 20 miles of shoreline. Loaded with natural beauty and wildlife ... you may even be lucky enough to see a Bald Eagle. The remnants of past inhabitants are still there ... old buildings in various stages of decay and family cemetaries. Stay out of the buildings ... they look safe, but are dangerous to enter.There is plenty of poison ivy so pack some Calamine lotion, just in case. Beautiful Lake Manitou is located to the north and center of the island. A hike to the northwest corner is not for the faint of heart, but the trek is well worth it when you come upon the amazing giant dunes. This kind of rugged hiking and camping is for the adventurous ones, seeking true solitude. The only campground is at the old village site. 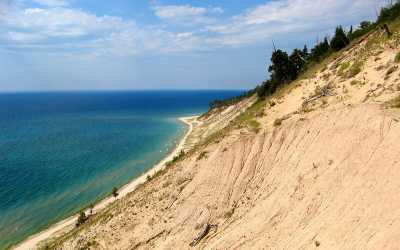 You will need a Sleeping Bear Dunes pass and a backcountry permit to camp here. These are available at the boat dock, or the Sleeping Bear Dunes ranger station at the entrance to that park. There are only eight campsites, two fire rings and one outhouse. The limit per site is two tents and four people. No pets are allowed on either of the islands. Again, be sure you have all the supplies you need for this "backcountry style of camping". The only thing available on the island is potable water, and emergency medical service at the ranger station. The trip to South Manitou takes about an hour and a half on the Manitou Island Transit 231-256-9061. This island offers guided tours if you like in open air vehicles. Tours run about 4 hrs. 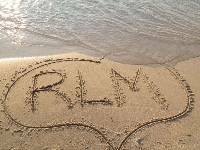 Giant cedars, miles of great beaches, and a lighthouse over 100 feet tall are just some of the interesting things you will find here. Bring your own lunch as there are no services on the island other than the rangers station. There are three campgrounds on the island ... camping here means you will carry your own supplies in and out, so plan for wilderness type conditions. Yes, this is roughing it for those who love this style of camping. The payoff is huge when you consider the pure beauty, amazing sunsets, and the two of you in this natural setting.